’View of the Sea at Scheveningen’ and ’Congregation Leaving the Reformed Church in Nuenen’ return to the permanent collection following conservation treatment. Left: ’View of the Sea at Scheveningen’ prior to the restoration. Right: ’View of the Sea at Scheveningen’ after restoration. Photos by Heleen van Driel. Van Gogh’s works View of the Sea at Scheveningen (1882) and Congregation Leaving the Reformed Church in Nuenen (1884-1885) go back on display at the Van Gogh Museum tomorrow. After being stolen from the museum in 2002, the paintings were recovered in Italy in 2016. The works returned home soon after, but have spent the last two years in the conservation studio being examined and restored. Axel Rüger, Director of the Van Gogh Museum: ‘We are delighted to be able to put these significant works in our collection back on display in the museum, where they belong. The conservators have done a brilliant job and the paintings will now go back on permanent display in their full glory, for everyone to see. Having the opportunity to see this happen before the end of my Van Gogh Museum career is a dream come true’. After the paintings had returned to the museum, it became clear that both works required conservation treatment. View of the Sea at Scheveningen was damaged during the theft; a considerable piece of paint was missing from the bottom left-hand corner. This lacuna was filled using a 3D-printed mould, which was developed based on scans and research to replicate the relief of the original brushstrokes. The conservator subsequently retouched this filling. To the museum’s relief, Congregation Leaving the Reformed Church in Nuenen was hardly damaged, but the painting was covered with a non-original glossy varnish layer that had yellowed over time. Investigation showed that this layer could be removed. The colours are now much brighter and cooler, particularly the sky. During examination of the painting, the conservator also discovered another varnish layer (protein based, probably an egg white varnish) that was applied by Van Gogh himself. This is the first time that such a layer has been found in the artist’s early work. New frames have also been selected for both paintings; the old frames were removed by the thieves. Download the pdf for more information about conservation treatment. From tomorrow (Wednesday 17 April), View of the Sea at Scheveningen and Congregation Leaving the Reformed Church in Nuenen will go back on permanent display at the museum. In the initial months, the paintings will be displayed alongside information about the conservation treatment. In mid-September, the works will return to their ‘old’ place in the presentation of the collection, alongside Van Gogh’s other early paintings. The research and conservation treatment process was filmed. 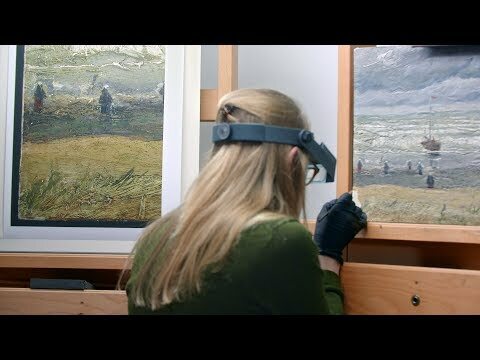 The episodes are available on the Van Gogh Museum YouTube channel, as are the previous episodes about the recovered paintings, under the title Van Gogh Returns. The Unravel Van Gogh web app contains visual material and more information about the paintings, the recent research and the conservation treatment. The web app is free to use via mobile, desktop or tablet. On Sunday 12 May, paintings conservators Saskia van Oudheusden and Kathrin Pilz will hold a Dutch lecture discussing the paintings and their conservation treatment. Entrance is free with a ticket to the museum. The lecture begins at 2 pm. The return and conservation threatment of the works is supported by the Ministry of Education, Culture and Science, the BankGiro Loterij, Van Lanschot, Heineken, Kikkoman Foods Europe B.V. and Bulgari.